With retirement on the horizon, we want to explore ways of reducing our living expenses so we can spend winters in a warm place and not be stuck in the frozen northeast for all nine months of winter! This is part one of a multi-part blog documenting our journey back to television service that won't break the bank or wreck the budget! Join Mindy and me as we "Cut The Cord!" Television used to be free, and some claim its value was exactly equal to its price! 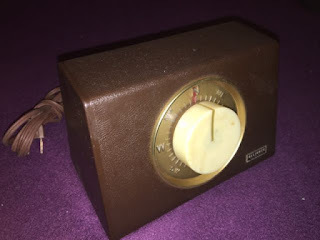 Growing up in the 1960s, my television experience consisted of a black-and-white picture, low fidelity monaural sound, and three channels to chose from. The remote was my sister, on those occasions when I could convince her to get up off the couch, walk across the living room, and change the channel or adjust the volume for me! Three broadcast networks, CBS, NBC, and ABC provided 100% of the content. (A fourth network, DuMont, was the first television network launched in 1946, but failed in the mid '50s and finally went off the air in 1956.) Independent stations that had no network affiliation, and non-commercial educational channels (which would become PBS) were only found in urban markets; they generally did not broadcast with as much power as the "network" stations did. The best part about those three-network days, however, was the cost. Television was totally FREE back then, that is, once you purchased a television set, put up an antenna, and committed to improving and maintaining it! My father was always trying to find ways to make our picture clearer with less "snow" and reduced static in the sound. Buying newer and bigger antennas, or adding another six feet to the pole to raise it higher were constant events in the Bradford household! The signal was delivered from the antenna to the TV by way of special un-shielded 300-ohm wire. Antenna wire was flat with two conductors spaced about a half-inch apart, and was responsible for over half of the signal loss and interference failures experienced back then! Obtaining (and maintaining) high-quality reception was almost a full-time hobby for my father and me back then! It seems we were always adding or fixing something on the antenna and wires, all for the sake of receiving the essential three television channels that we watched on our old B&W set. About 1966, my father added another piece to our maintenance challenge, a rotor system which could turn the antenna and orient it to obtain the strongest signal from the broadcast tower. 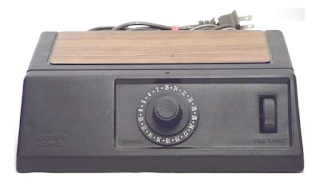 A control box sitting on top of the TV was used to point the antenna to the desired compass direction. At that time we were living in Norwich, CT and received our TV signals from three different cities. The ABC station, channel 8, was from New Haven. The CBS station, channel 3, was from Hartford. Our NBC programs came from Providence, RI, on channel 10. Changing channels on the TV tuner also required turning a dial on the rotor control box which sent power to a motor mounted on the antenna mast which in turn pointed the antenna to the correct city. It could take as much as a full minute to rotate the antenna from one direction to another, with the control box making a loud "hum-click" sound every two seconds or so while the antenna was rotating! There was this thing coming along back then that people called "Pay TV," and according to an article in the newspaper, it was soon going to be available in Norwich! CATV (Community Antenna TV) was envisioned as a way for people who lived outside of urban areas to share common antennas (located high on nearby mountains or hills) and therefore enjoy better reception. Shielded cable was used to deliver the amplified signals to subscriber's homes, and the cost would be shared among the subscribers. My father said Pay TV was wrong and that he would never pay for something that we could obtain for free! Once we moved to northern New Hampshire in 1970, however, things changed! With only two stations available over the air (one a very weak CBS signal from Burlington, VT, and the other the Mount Washington based ABC affiliate, WMTW) my mother put her foot down and decided we were going to have cable TV! The days of putting up antennas and maintaining them were over! We were then enjoying ten channels (three of them from Canada with one in French) and the clearest, most interference-free picture we ever saw! Changing channels was so easy ... all we had to do was get up and turn the tuner dial! No more noisy rotor box! If I remember correctly, the monthly charge from Paper City TV Cable at that time was well under five dollars. Quite a deal by today's standards! For the first few years of my married life I was living in the Boston, MA television market with several over-the-air channels available. After my Army service I returned to Lancaster, still with only two broadcast channels available. A year or so later Kim (my wife at that time) insisted that we get cable so she and our two young sons would have more entertainment during the day. We paid about $7 a month for 12 channels. TV was entirely analog in those days, and 12 channels was the limit for the old VHF (2-13) broadcast band. 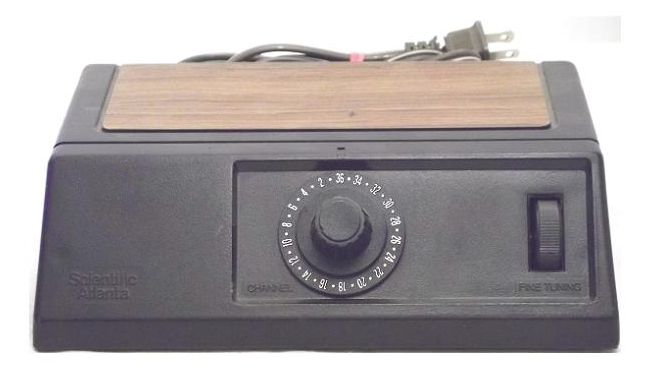 Soon the local cable company was purchased by Warner Bros. and started offering more channels by using a set-top tuner box. The TV was tuned to channel 3, and a dial on the box was used to select the desired cable channel. "Basic" cable was still available, but for just a few dollars more the new enhanced cable became the up and coming thing. Special cable-only channels like CNN and MTV, along with "Superstations" and more made basic cable seem so ordinary! Extra cost movie channels were also available that brought recent theater presentations into our living rooms and would add several dollars to the monthly fee. As years progressed, cable TV channel offerings continued to grow, along with the monthly charge! According to a report issued by the FCC in October, 2016, a study conducted between 1995 and 2015 shows that the average prices charged for various cable packages has risen at over twice the rate of inflation! In 1999 I was paying $33.01 a month for cable. In 2010, when I switched from analog cable to digital service (with phone and Internet) it was up to $58.07 After the programming portion of the combined package rose to over $100 in 2013 I switched to a satellite provider at $61.99 per month. Now, five years later in 2018 that same TV package is costing us $123.82 each month. Television has become our fourth-largest monthly household operating expense, after groceries, heating fuel, and electricity. Just think ... it used to be less than $10 a month! Living where we do in northern New Hampshire, we no longer have over-the-air options. WMTW (Portland, ME) stopped broadcasting from the top of Mount Washington in 2002 in preparation for digital broadcasting. WCAX's digital signal is not watchable this far away from Burlington, VT. An analog repeater station 20 miles away in Littleton, NH provides NH PBS programming for that community, but terrain issues make reception impossible here. Broadcast TV is simply not an option in Lancaster! We'll be back (after station identification) with Part 2 of our adventure as we Cut The Cord! Wow you have a great memory,but we agree the cost if television is crazy.We have kept our satilite network here in Florida, because it is all we can get in the North Maine woods from May-Oct. I still have a separate phone and internet service in Florida that I put on vacation when we leave,but as you said it keeps going up.So if you have figured out how to cut the cord, I am anxious to see part 2!!! Cutting The Cord (Part 2) - Simply Complicated!